Last week on my Snapchat I shared my top tips for detoxing my wardrobe and I got such a good reaction to it! As it was only up for 24 hours, I’ve decided to put my tips into a blog post so it’s always here on Holy Chic for you to come back to whenever you need it! So lets get to it.. 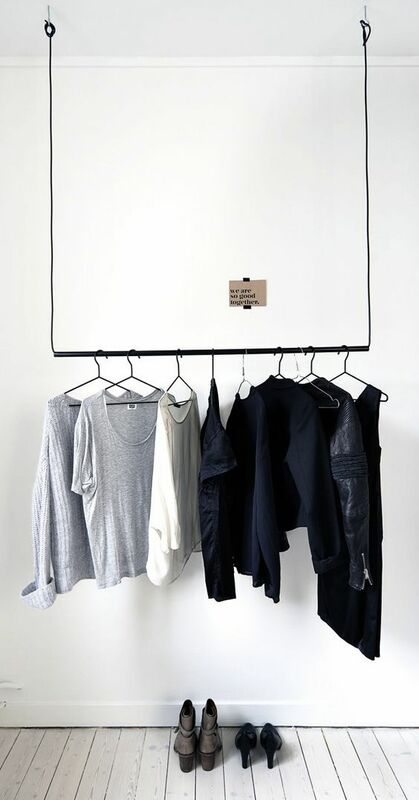 In my room, I have a wardrobe and a free standing rail so I sort my clothes by season. The pieces that are out of season go away into the wardrobe until I need them again and the clothes that are in season take pride of place on the free standing rail. I personally like the rail because I can see everything at a glance and as it’s a double hanging rail it fits more than the wardrobe. I have mine for years now but this one from Home Store and More is quite similar and really cheap! 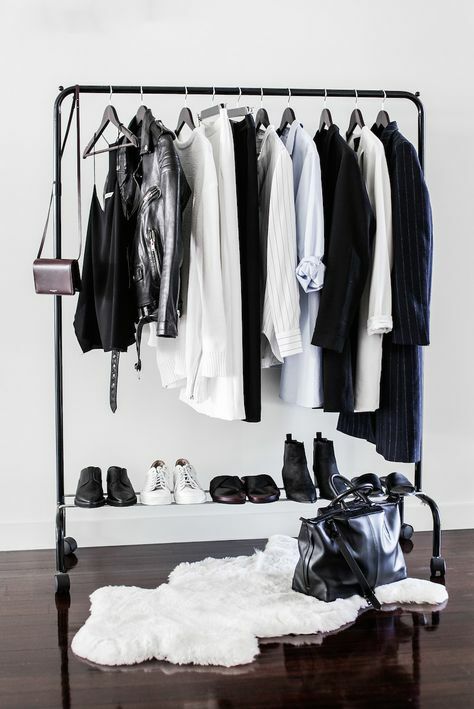 Obviously this isn’t practical for everyone so you can sort by season by keeping your in-season pieces in the wardrobe in your room and the out-of-season bits could go in the wardrobe in your spare room? Vacuum storage bags like these ones from Home Store and More are another option and they take up much less space. 2. My Holy Grail Tip! This tip is my all time favourite – I think I read it on Pinterest years ago but it has worked well for me and I think it’s a must!! 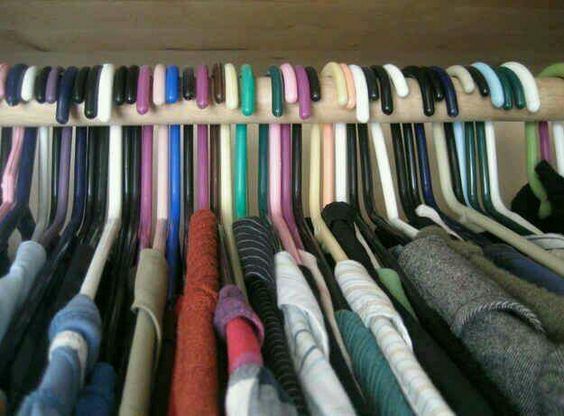 When you’ve detoxed your wardrobe, turn all the hangers backwards like in the picture below. Each time you take something out to wear it, pop it back in the wardrobe facing the right way around. When it comes to your next detox, whether that’s in 6 months, 9 months or a year later, anything that is still hanging backwards needs to come out and go into ‘The Pile’! If you haven’t worn it in that long, chances are you’re not going to wear it, so these pieces need to be reviewed 😉 Even with this tip alone, you will see a huge difference in the amount of space you now have in your wardrobe! Look at what your wardrobe now consists of and see do you have the key pieces to take you through the season? In my opinion, for this Autumn/Winter you’ll need a bomber jacket to take you through the transitional time; midi length skirts that can be dressed up or worn to work; an everyday jacket like this biker style one – again this can be worn for casual wear or when you’re on a night out; a good blazer that will see you through a multitude of occasions; and a decent long line winter coat that is lined and has enough space for you to wear a jumper underneath. 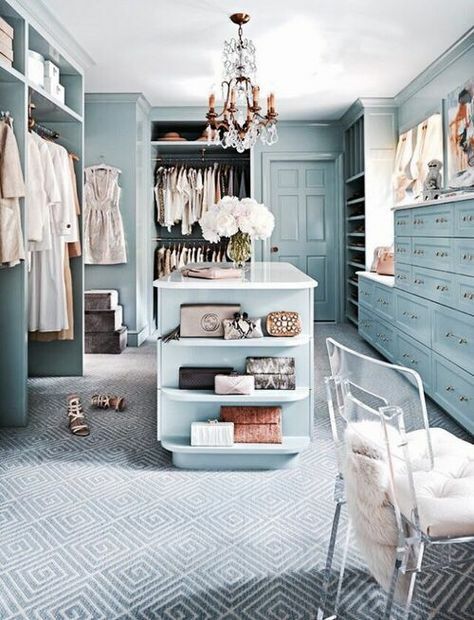 You’ve sorted through what’s left of your wardrobe and ensured that you have some capsule pieces so now it’s time to tackle ‘The Pile’ that has accumulated on your bed/floor/chair. I don’t make a decision about where an item of clothing is going when I’m taking it out of the wardrobe, everything goes into one pile and I sort them from there. 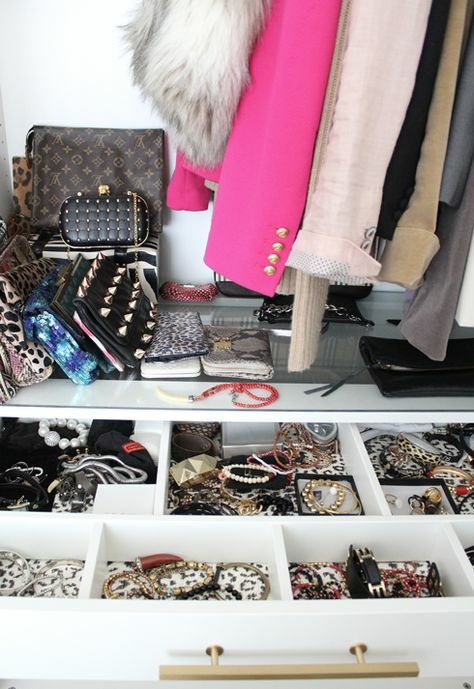 I just believe that this works best and you make the right decision because you will have gone through what’s left of your wardrobe by now and will be more informed on what you really need. Start at the top of the pile and take it one piece at a time. I ask myself why it’s ended up in the pile? Is it really old or in bad condition? If so, it can go into the first mini-pile; Bin It. If there’s no chance that it can be saved or passed on, it’s going in to the bin, forget about it! 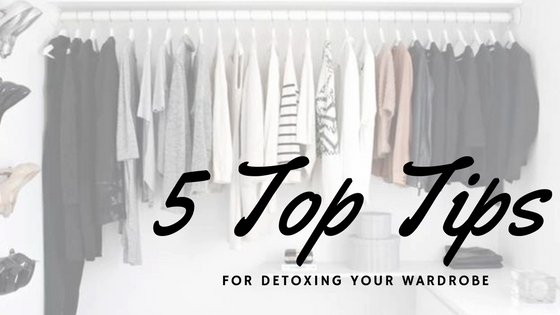 If it was still facing backwards in your wardrobe, ask yourself why you haven’t worn it since your last detox? Were you not able to make an outfit with it or did you fall out of love with it? Was it a sale bargain that you picked up because it was like 90% off and you just couldn’t leave it in the shop? If so, the next pile is; Pass It On. This pile consists of clothes that are still in good enough condition to wear but just aren’t serving a purpose in your wardrobe. These clothes don’t have to go straight to a charity shop either – let your family or friends have a root through it if they want. They could absolutely love something in there or have something themselves that they could swap with you. Whatever is left in this pile can be donated to charity which is a great cause. 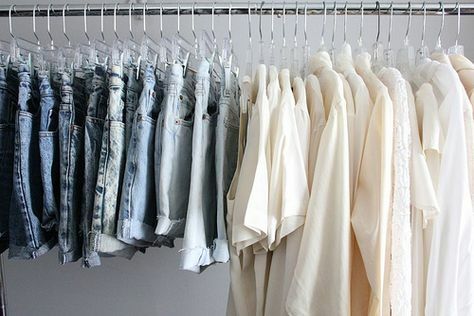 Like with merchandising in retail, having some sort of order in your wardrobe will make it look much more attractive and appealing to you. Personally I have my rail organised by colour so I can easily see the colour palette that I have to work with and it also makes it easy to pull an outfit from. 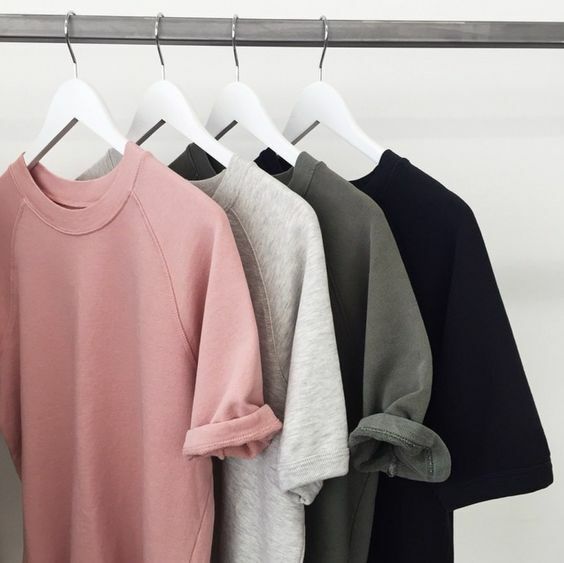 You may like to organise it by the type of item, so your tops, shirts, jumpers, jackets, coats, skirts, pants and dresses in sequence or arrange it by the type of event it’s for, so your work clothes together, then everyday casuals, going out clothes and then gym gear. Find what works best for you and it will make life so much easier. A couple of bits that I find are really handy are organising your wardrobe are things like these hangers. They’re just €2.99 for a pack of 2 and will hold belts or scarves neatly hanging in your wardrobe. I also have one of these fragrance sachets hanging in the wardrobe and another in the rail. There are a range of scents to choose from and they keep your clothes smelling gorge! I recently picked up one of these rolling underbed containers too which is so handy for storing bags, shoes or accessories underneath your bed or wardrobe and it keeps your bits safe, free from dust and out of site. Previous Post What Kylie’s Cosmetics are Really Like!